Nestled in the scenic rolling Ice Age Kettle Moraine countryside of Eastern Wisconsin, the Manitowoc County Historical Society is a museum of living history. Feel the heat from the blacksmith's forge, take part in one-room school lessons, and find your ancestor's name in our archives. 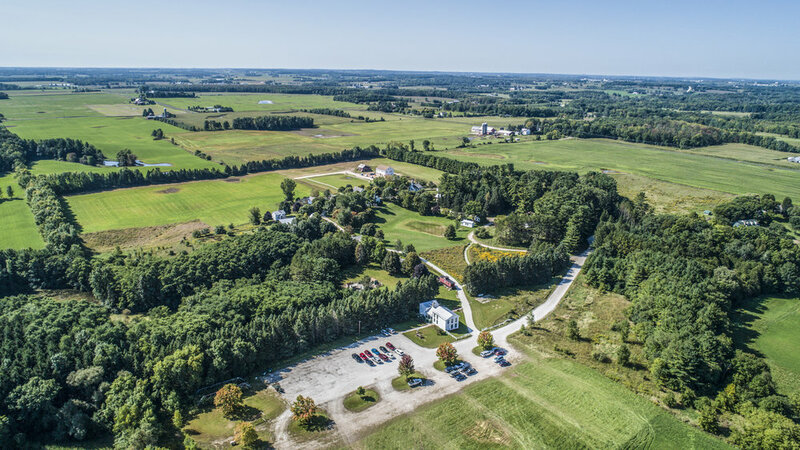 This 60-acre interpretive museum of local history features a Welcome Center with local history exhibits and research services and the outdoor Pinecrest Historical Village - a collection of over 25 historic buildings with period furnishings from Manitowoc County's early settlers. The Manitowoc County Historical Society is made possible by you. We are a private, non-profit organization that strives and thrives because donors like you believe in our mission and vision. The McAllister house is believed to be the oldest standing farmhouse in Manitowoc County. Originally located on Plank Road in Manitowoc Rapids, the home was built by Hiram McAllister, one of the first settlers of Manitowoc County who came to the area in 1837. After working his 178-acre farm for many years, McAllister returned to New York State in the 1870s. Other owners of the property included John Landreth, Henry and August Eberhardt and Agon Haupt. On May 1st, 2013, the McAllister House opened at Pinecrest Historical Village, following a successful $200,000 campaign to transform the building. Each year, thousands of visitors will cross the wide plank pine floors and explore history inside the walls of hand split lathe that once provided shelter to Manitowoc County pioneers such as Hiram McAllister and the August Eberhardt family. The building includes local history exhibits, research library and archives, as well as the Society's administrative offices. Comprised of over 30 structures from throughout Manitowoc County, Pinecrest Historical Village is a journey through our community’s past. Click on the link below to learn more about the museum’s historic structures. Welcome to a space made just for kids to play, explore, and learn. Visit the Discovery Village with young visitors and venture through miniature structures full of educational hands-on activities and play experiences. Heirloom gardens add another dimension to your museum experience. Eye-catching blossoms, fragrant herbs, luscious fruits and rows upon rows of colorful vegetables all vie for your attention, but they're also used regularly by village interpreters for preparing meals in the historic kitchens, dyeing fibers, medicinal preparations as well as decorations and craft projects. Garden tours with an experienced horticultural interpreter can be arranged throughout the season.